Court Jew of Duke Peter Biron of Courland; born in the middle of the eighteenth century; died at Mitau in 1828, on the same day that his brother Simson died. Owing to the influence of the Borkum brothers, Jews were permitted to settle permanently in Mitau, to organize themselves into a community, and to engage in trade and handicrafts within the dukedom of Courland. 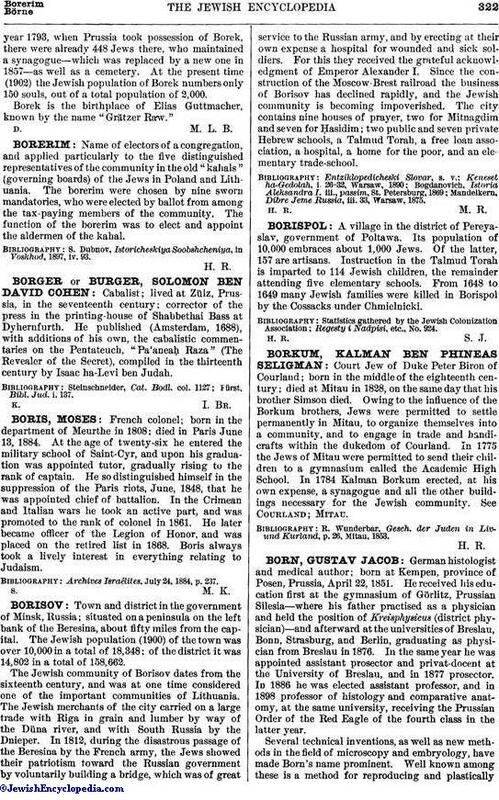 In 1775 the Jews of Mitau were permitted to send their children to a gymnasium called the Academic High School. In 1784 Kalman Borkum erected, at his own expense, a synagogue and all the other buildings necessary for the Jewish community. See Courland; Mitau. R. Wunderbar, Gesch. der Juden in Livund Kurland, p. 26, Mitau, 1853.